He delivered a double whammy when he came with me to the hospital to see his mother and baby sister for the first time. He nodded and held my hand as we walked into the birth centre. 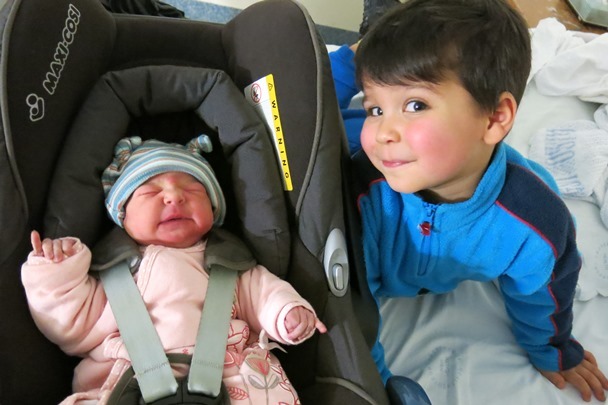 His face lit up when he saw his mummy and he was in awe upon seeing his baby sister. He then instructed all of us to talk softly so as not to wake the baby up. When one of the midwives came into the room to check up on my wife and baby girl, I left the room to refill a glass of ice water and reheat the hot water pack. On the way back to the room all the midwives were having a chuckle and I soon found out why. When the midwife entered she started to talk with my wife about her medication requirements. Later on, during this hospital visit my boy asked the question that we had both not been keen to answer all the way through the pregnancy. I had to jump in quickly to cut it off at the pass. He thought about both answers and this seemed to satisfy his curiosity. I am expecting that one soon. It is funny, because my wife passed on a link to this post to his teachers and sure enough they have a bottled response.